Jose Cruz Garcia Rocha was born in Cerro de San Pedro, San Luis Potosi in 1948. His parents were farmers and he learned to read and write under the tutoring of his sister Antonia, who because of her love for children had become an empirical teacher in the town of San Elias, Armadillo, where Cruz was to live his childhood years. In 1964 he traveled to Mexico City and worked a number of odd jobs got through elementary school on his own. While he is in Mexico City, he comes in contact for the first time with art by admiring the works on display at the Palacio de Bellas Artes and the Museo de Arte Moderno. The love he developed for this craft was sufficient to motivate him to follow his instincts. He realized that the drawings he made in his childhood were an internal need to express his ideas and that his given talent could be developed. In 1970 he returns to San Luis Potosi to help his parents in their work on the field alternating farming with travels to the state's capital (about 20 miles) in order to study painting at the Instituto Potosino de Bellas Artes. He is awarded the title of "Maestro de Pintura" from that same institution a few years later. In 1974 he is Honored in his state and his work is exhibited collectively at the Casa de Cultura de Aguascalientes, Casa de Cultura de San Luis Potosi, the IPBA Gallery and the German Gedovius Gallery both in San Luis. 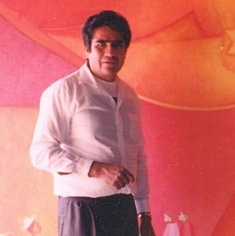 In 1976 and 77 he is awarded honors at the 20 de Noviembre Contest by the Government of San Luis Potosi for his works "Fecundidad" and "La llegada de la Luz". From 1978 to 1997 his work is displayed individually at the Casa de la Cultura de San Luis Potosi and Museo del Parque Tangamanga in San Luis, Galeria Dr. Atl, Galería Marstel, Galeria del Bosque, Galería Frida Kalho, Galeria Café y Arte in Mexico City , Galería San Miguel and Galería Atenea in San Miguel de Allende, Centro del Constituyente de Texcoco, Centro Cultural Chimalpain de Chalco, hotel Las Hadas de Manzanillo, Colima, Casa de la Cultura Jalisciense in Guadalajara, Museo de San Juan in Argentina, Galería Collage and Art Dealers in Monterrey, Foro Cultural "La Pajarita de Papel" in Querétaro, Galería El Alebrije in Saltillo, and the Premrow Gallery in NYC among others. In 1998 "La Buhardilla Arte Latinoamericano" in Tucson, Arizona adds his work to his permanent collection and organizes an exhibit in his honor. And in 1999 his work traveled to ART MANEGE 99, in Moscow, for an individual exhibition.